The Trump Administration is threatening to undercut federal protections for the small streams and wetlands that are essential to the health of rivers and lakes. 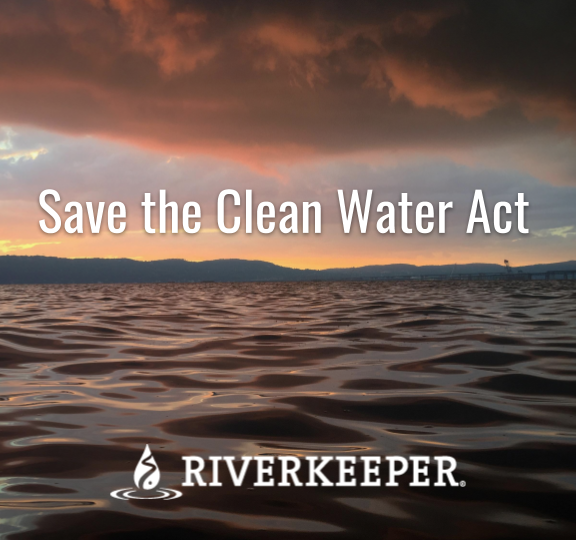 Riverkeeper is joining the Waterkeeper Alliance and water advocates nationwide in opposing this attack on the Clean Water Act. You can make a difference now by submitting a comment to the U.S. Environmental Protection Agency and the Army Corps of Engineers by April 15. Read the sample letter (below) and add your own comments. Personalized comments have a greater impact! I am opposed to EPA's Revised Definition of "Waters of the United States." This proposed definition is a blatant attempt to cater to polluters' wishes by removing Clean Water Act protections for waterways around the nation. Clean water provides many benefits -- from safe, affordable drinking water, to recreation and jobs. When threats to safe drinking water are widespread in our nation, we should strengthen protections for clean water, not rolling them back. The Clean Water Act was created in recognition of two simple facts: waterways are connected and pollution moves downstream. If a company pollutes or destroys a stream, wetland, river or lake, the impacts will inevitably be widespread. And in the years before the passage of the Clean Water Act, piecemeal water protection led by states did not sufficiently protect our right to clean water. It never will. I am opposed to EPA's proposed definition of waters that qualify as "WOTUS," and the specific exclusions set forth in the rule. For example, the decision to no longer categorically includes "interstate waters" as covered under the Clean Water Act is not only illegal - it is also illogical considering that pollutants do not obey state boundaries and the Clean Water Act often provides downstream states with the only meaningful recourse to address pollution from upstream states. Excluding "ephemeral streams" ignores the important ecological functions of these waterways and the fact that any pollutants released to them will travel downstream. Despite widespread recognition of the vital roles that wetlands play - including improving the quality of nearby surface and groundwater quality and flood-control - the standards set forth in this rule would remove protections for more than half of the wetlands in the nation. This rule's singular purpose is to give polluters a free pass. It will lead to the widespread degradation of waterways. It flies in the face of the Clean Water Act and EPA's mission to protect human health and the environment. EPA's goal should be the opposite of this proposal -- to provide the maximum clean water protections to all communities. Therefore, I ask that you not finalize this rule and instead maintain Clean Water Act protections for historically protected waterways.